Do you want to make better more consistent reeds without getting an ulcer? •You are serious about improving your oboe reed making. That’s why you are here. •You’re tired of not having consistent oboe reeds. That is why you are here. •You’re a beginning reed maker and not sure how to start. That is why you are here. Believe it or not, learning how to make oboe reeds consistently is really not that hard. It does however take a lot of dedication and practice. The first thing you must learn is to recognize what it is you want in a good oboe reed, and how a good reed functions. You can have the best knife technique in the world, but it is a waste of time and effort if you have not mastered this one concept. Learn to recognize how a good reed vibrates, feels, functions and looks. The Making Oboe Reeds Ebook will show you all of this and a lot more. •Always have a good reed for concerts and lessons. •Spend less time on your carpentry skills. •Have more time to improve your musical skills. By picking up a copy of Making Oboe Reeds you will have this specialized information. You might be wondering if this book is really for you. 1.If you are a serious oboe student and really want to get a handle on oboe reedmaking in plain, easy to follow instructions and take your reedmaking to the next level, then this book is for you. 2.If you are an amateur oboist and never really learned how to make reeds and finally want to start, then this book is for you. 3.If you are a teacher and need a method to help teach reedmaking to your students of any level, then this book is for you. 4.If you are just starting out, or do not have access to an oboe teacher all the time, then this book is for you. Is this a physical copy of a book, or a file or “ebook”? This book is a digital “ebook”. Basically, it’s a “.pdf” file to be exact. What that means is that you download the entire book to your computer and either read it there, or just print out a copy. This also means you don’t have to wait for it in the mail! This book teaches a very typical “Philadelphia” style of reed making that was first developed by Marcel Tabuteau of the Philadelphia Orchestra in the early 1900′s. This style has developed into what is known as the “American” style characterized by the long scrape. This 116 page, step-by-step manual, teaches you not only how to scrape the reed, but also how to honestly evaluate it. Because there is more than one way of going about making a reed, several different methods of reed making are covered in the book. There are also sound clips embedded into the ebook of reed crows. The crow of the reed is the most important information source we have when scraping the cane, so it is important to hear and learn what the crow should sound like. •How to look at and evaluate the reed objectively. •How to balance a reed. •How to use the crow of the reed to tell you what to do. •How to make your air, embouchure, and reed work together. •How to make reeds at high altitudes. •How to systematize your reed making to obtain more consistent results. •How to stop worrying about reeds! Also included is email support for any reed problems you may have. If you have any questions or problems, simply send me an email and I will try and give you a hand. Free updates of the book. As technology changes, I will add things now and then to the book. You will be entitled to all of these changes FREE of charge. All of this information is worth hundreds of dollars if not more when you consider how much private classes with a well known teacher in a major symphony will cost you. In many cases over $100 a lesson. 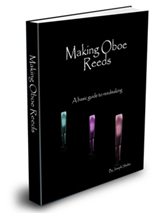 In the Making Oboe Reeds Ebook you will see the actual methods I and other professional players use to make oboe reeds, and I have put all of my 18 years of professional playing and teaching into this book. So why am I selling the Making Oboe Reeds Ebook for less than $100 or even $50? Quite simply for this reason. This is a downloadable ebook “.pdf” file that you initially access over the internet. I have no inventory or product fulfillment costs of any kind. No printing costs, no secretaries, or other costs other than my online expenses. Because of this, I can pass all of these savings down to you. That’s more money for cane and other supplies, which I am sure you know is VERY expensive these days and not getting any cheaper. This is a win-win situation for both of us. I save in costs and you save on the price. Definitely – I will give you 60 days to decide whether or not Making Oboe Reeds is for you, and if you decide you don’t like it, I will give you your money back with no questions asked. I am that confident that you will find the information in this ebook very useful. 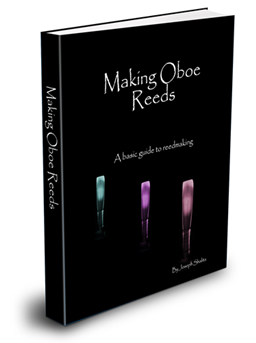 Download the Making Oboe Reeds Ebook now and begin learning how to make great consistent oboe reeds! All the best, and may you always have a great reed. P.S. If you came to this website looking for information on how to improve your oboe reed making, then this book is 100% for you. So order it right here. P.P.S. You have nothing to lose and everything to gain with our 60 day, no questions asked, 100% money back guarantee. Act quickly because since I am offering this book for a lot less than other reed making methods on the market, the price won’t last forever. It will go up. P.P.P.S. Don’t Wait. Stop being frustrated over bad reeds that make your life miserable to play on. Believe me, I have had some pretty rotten reeds that I have had to use during my career. It’s not fun but you can do something about it. Take that step.